READ ABOUT US IN "THE DISAPPEARED "! Bestselling author C.J. Box stationed Joe Pickett at our hotel in his best selling novel, The Disappeared. If you are a fan of Joe Pickett, stop in and toast him with a glass of cheer from our large selection of Wyoming brews. You can also buy a copy of the book here at the hotel. The Wolf Hotel opened on New Year’s Eve, 1893, with a gala masquerade ball and sumptuous dinner. The two-and-a-half story Victorian-style structure was built for $6,000 by German immigrant Frederick G. Wolf. Soon nicknamed “The Grand Old Gal” of the North Platte Valley, the hotel is still going strong after more than 120 years. 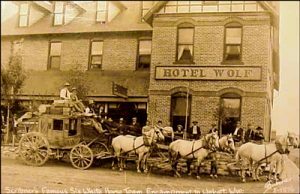 In fact, The historic Wolf Hotel and Restaurant is the place where people gather in Saratoga, Wyoming. Anchoring downtown Saratoga, The Wolf is within walking distance to shopping, free natural hot springs, and the North Platte River, a Blue Ribbon fishery. Concerts, art shows, rodeos and bull riding are highlights of the summer season, along with fishing, floating, hiking, hunting, skiing and snowmobiling enjoyed in the fall and winter.At the end of March, Saratoga hosts the Wyoming Open International Pool Tournament. Listed on the National Register of Historic Places in 1972, the Hotel Wolf has seen several incarnations in her years of existence. She served as a stage-stop on the C.M. Scribner Walcott to Encampment Stage Line, a barber shop, a guiding/outfitting service, an art gallery, and even a drive-through package liquor store. Local owners and managers Douglass and Kathleen Campbell have restored the hotel to appear much as it did on its opening day, and added modern conveniences and amenities to ensure your stay in this beloved icon of Old Wyoming is an enjoyable one. Spend the night in a comfortable, clean room, furnished in period-style furniture. Enjoy a meal in our elegant dining room, serving exceptional, freshly prepared food. 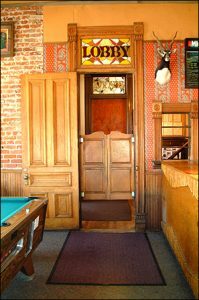 Then, kick back in our old-time saloon, complete with swinging doors, a pool table and TV sports coverage. Our beverage selection includes wines, cocktails and beer, including regional microbrew favorites. For lighter fare, the Pub Menu highlights a variety of tasty appetizers, delicious sandwiches and the best burgers in town! Come for a relaxing vacation, to celebrate your special occasion, or to refresh and refuel after your outdoor adventures in the Valley and the surrounding mountains. We are open year-round and look forward to sharing our hospitality and top-notch service with you! "I really love this place. I fell in love with it 20 years ago. The rooms are unique and beautiful, everything is reasonably priced and the staff is great. It's a great small town experience." "This property was absolutely wonderful...beautifully cared for HISTORIC hotel. We loved it and are figuring out how to make a return trip next year ."